FindItMore | Workplace safety is one of the pressing issues in the business landscape these days, particularly in sectors such as manufacturing, construction, and oil and gas. According to a survey from Occupation Safety and Health Administration, there were 5,190 workers killed on the job in 2016 in the U.S. In another study conducted by the National Safety Council; it was also reported that one worker gets injured on the job every seven seconds – translating to over 4.5 million work-related injuries per year. The rising trend of workplace injuries nowadays implies that some organizations are falling short on placing and implementing safety protocols in their workplace. As many people are aware of, a workplace injury, regardless of how minor or serious it may be, can change the lives not only of the employee, but also of their families, friends, and coworkers too. It is therefore imperative for businesses to ensure that the workplace is safe and secure for their employees, and that necessary standards and systems are in place to minimize the situations that may put the lives of their workers at risk. Every employee has the right to work in a safe environment, but when they are assigned to work in a risky facility, they must be provided by their employer with the appropriate safety training and equipment. If a worker is injured on the job because the business fails to issue him or her right personal protective equipment, the business will suffer a lot of financial damages due to lost work hours, increased insurance rates, worker’s hospitalization and increased compensation premium, and possible litigation. Aside from wreaking financial havoc, work-related injuries and deaths will also destroy the reputation of the company in the industry and may even be banned from operating forever. Such detrimental effects of simple negligence towards workplace safety are the reason why companies must invest in safety systems and equipment, particularly in personal protective equipment(PPE). From earplugs, hard hats, gloves,and full-face masks, PPE can significantly help prevent the workers from the common incidents that occur at the workplace. 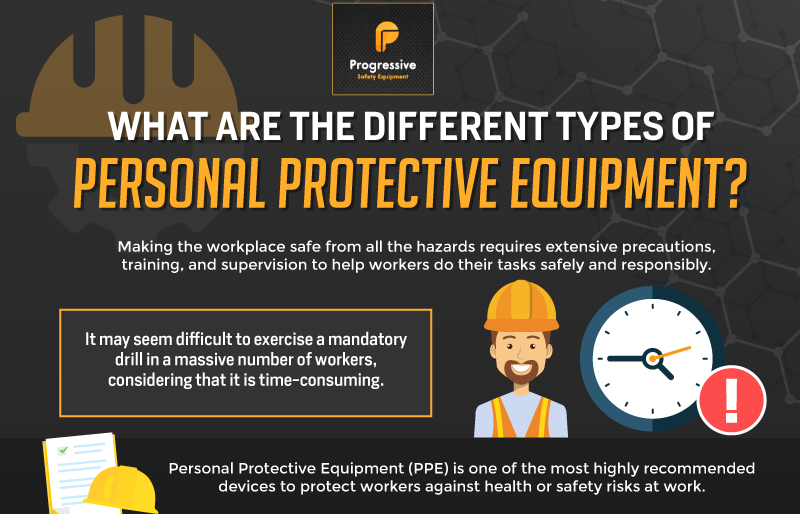 To give you more insights about the significance of issuing the right protective equipment to your workforce, here are the key takeaways of the infographic below from Progressive Safety Equipment, detailing the different types of personal protective equipment you need in your workplace. To learn more on how these equipment helps reduce the safety risks your employees face in their day-to-day jobs, check out the infographic below.